What’s the best all around small PA top available today? Those who have built them agree that it’s the DR200. And what’s one of the most difficult speaker cabinets to build? Those who have built them also agree that it’s the DR200. Superior performance doesn’t come easy. So what do you do if you aren’t a master woodworker? If you’re willing to settle for the second-best small PA top available build the Omni Top 12. Measuring 15 x 22 x 18 inches and weighing only 35 pounds Omni Top 12 is only surpassed by the DR200 in its size class for output. The 6dB sensitivity differential means one OT12 driven with 200 watts is as loud as two XLT43e driven with 400. 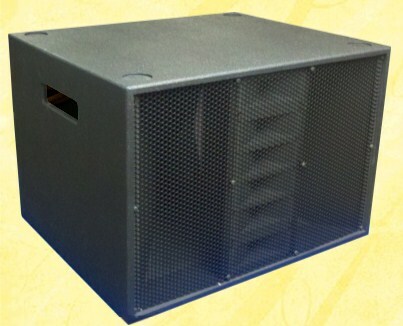 The OT12 may be built with a single compression driver on a CD horn like the XLT43e, or it may be built with a six element vertical tweeter array for line-array stacking of multiple cabs. The OT12 may also be built with a twelve element cross-firing melded tweeter array, as pictured above, giving high frequency dispersion that no commercial PA top can match. Or, for the highest possible output at the longest throws, build yours with a premium compression driver on a line arrayable full cabinet height horn. Need more power? Build the OTop as a 2x12 and load it with Kappalite 3012HO woofers, for 900 watt power handling with sensitivity and output that no commercial cab of equal size matches. The plans go into great depth, showing you not only what tools to use but also how to use them. Included are tutorials on wiring and crossovers. Running a big rig? The OTop 12 JArray is designed for stacking in the preferred curved front 'J' configuration. 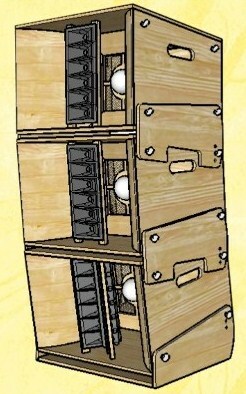 The JArray also incorporates advanced construction techniques that allow it to come in between 20 and 30 pounds, depending on choice of drivers and materials. The standard OTop 12 and OTop 12 JArray are separate plans. You must specify the version you want on your order. Plans are $14.95, delivered within 24 hours as email attachment in MS Word format. 36 pages, 14 photos, 71 diagrams. PDF version available on request. These kits are precision CNC milled from top quality Baltic Birch. Flat packs do not come with plans, you must order those separately from us.